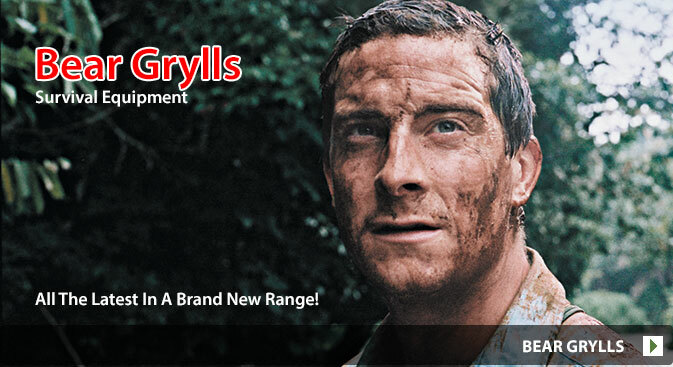 We have an ever increasing stock of Bear Grylls survival gear and Bear Grylls clothing. The original Born Survivor star Bear Grylls has teamed up with Gerber to provide the best and highest quality survival products on the market. We have many items in stock and much more at our store. Bear Grylls is an ex SAS survival expert and is famous for scaling cliffs, jumping from helicopters, balloons, and planes, ice climbing, running through a forest fire, wading through water rapids, eating snakes, wrestling alligators and all manner of crazy adventurers. So he is ideally placed to offer advice on the best survival equipment for any situation. If you are keen on adventure then you could you the right clothing and equipment to not only look the part but be able to adapt to any situation. Bear Grylls clothing and equipment gives you that. If you can't find what you are looking for on this page please call us on: 01293 525880.